We were tired last night and did not get up until 8AM to an overcast morning. We spent the morning catching up on a multitude of paper work. We had the paper war fought and won by 10:15AM. Joan walked the letters over to the Post Office while I had a shave and shower. We phoned Ottawa for one address. We felt one character in the Postal Code was wrong. Joan had the Post Master check this Postal Code and three characters were wrong. So much for efficiency. This is a great place to camp. 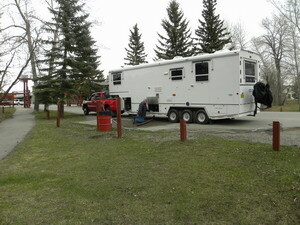 It is a couple of minutes walk from the trailer to the Post Office and the down town area. We had lunch and hooked the truck to the trailer when Joan came back. We departed site 11 at 11:57AM and went to the town dump station at the entrance to the park. We cleaned out the tanks. 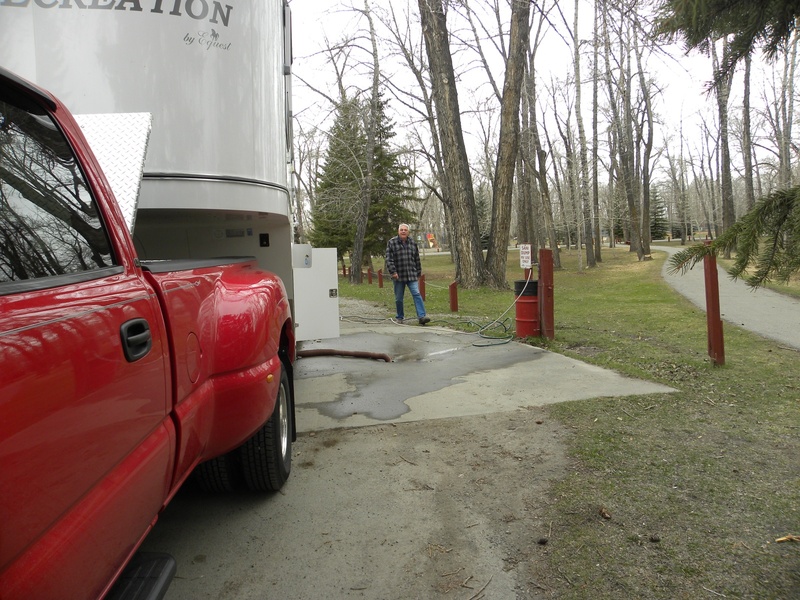 Have you ever wondered how exciting it is to empty the holding tanks in a recreational vehicle? Well, here you have two views. It does not get more exciting than that. Today they have three holding tanks. The three tanks are Fresh water, a grey tank and a black tank. The grey is the shower and sinks and the black is the toilet. 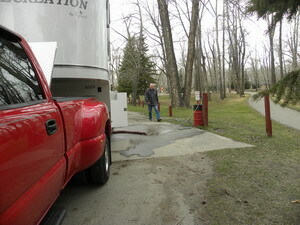 Years ago there were two tanks, the fresh water usually at the front of the trailer and the holding tank at the back. We have no idea why there are the three holding tanks today. Probably so one can dump the grey tank just about anywhere. Note the little door that is open at the front of the trailer. That is the compartment that holds the brown sewer hose. The cheap green garden hose that is connected to the end of the white hose, is the hose we use to wash out the black tank via the toilet. We also use it to wash the sewer hose before putting it away. There are fancier ways of doing these things but none as efficient as the way we do it. I am kneeling on a rubberized kneeling pad Junior gave me many years ago. The thing is worth its weight in gold and I could not camp without it. It is used in many ways and a big help in putting blocks under the trailer when blocking it up. From the dump station we went to the Esso station, filled the propane bottle, the truck's diesel tank and washed the truck and trailer. We did not get the left side of the trailer washed. I could not get the hoses to work on that side. There was a toggle switch for that and no sign. Oh well, now we know but I doubt we will need to know. 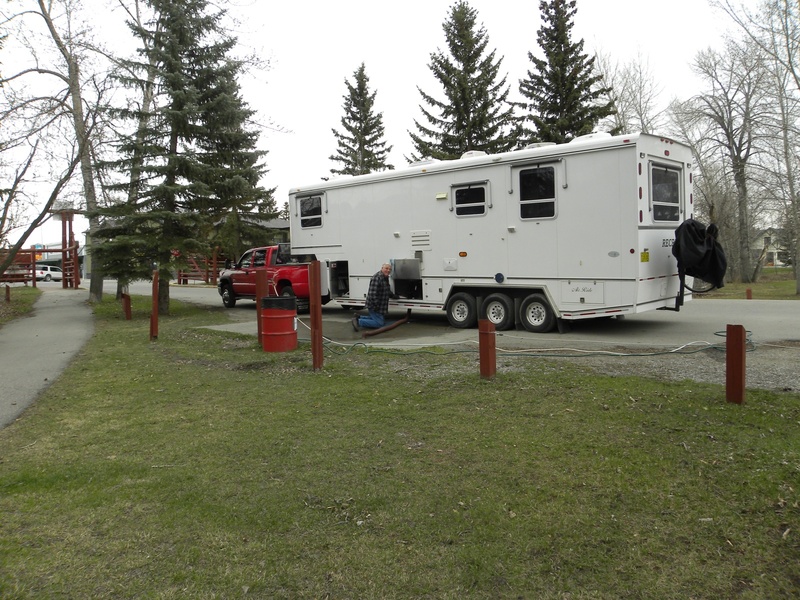 We put six kilometres on the trailer and we were back on site 11 at 1:42PM. We topped up the fresh water tank, that was nearly empty before coming on the site. It was nice to have something to do. We spent the rest of the afternoon laying around and reading. From 4PM until 4:30PM I gave a call on 7055, 3740 and 14023 kilohertz but did not receive a reply. There was activity just above 14023 from New Jersey. When I put the HF antenna back up it was resting against a small tree limb. We can always load tree limb and all with this tuner. We have so little power the tree limb was probably grabbing it all. I made it on the Aurora net around 5:50PM. Jerry, VE6PL, relayed a note to Bill, VE4DL, and brought him up to date on our whereabouts and possible plans. Bill and I went to school together and is all excited about getting together as we pass through Winnipeg. One can get more detail on Bill by bringing up my history of the Halifax Club on this site. Just put Bill's VE4DL call sign in the search area and this detail should come right up. Supper was over and the dishes done by 6:30PM. There are units coming and going in this park that keep us entertained. There are always one or two that remind us of someone. Then there are those walking or running along the Highwood River bank. There is quite a wall of dirt along the river bank to prevent flooding here in the park and town. It was overcast all day and about 48F most of the day. Just before 8PM the sky cleared and the sun shone until it got dark. It does not get dark here until after 9PM. We watched a long movie Jeff had with his collection. It was a very good movie on Australia during World War II. Our day ended with the movie.